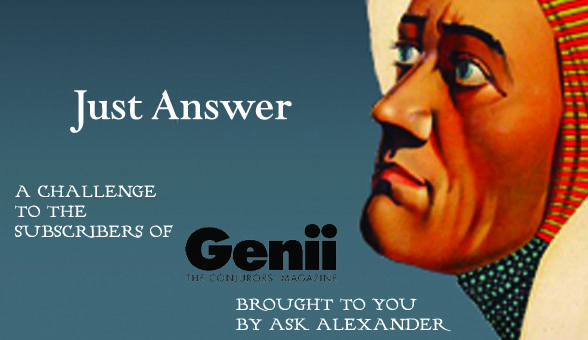 Genii Magazine and Ask Alexander Research Contest! In honor of Erdnaseum and the collaboration between Genii Magazine and Conjuring Arts, we are offering a contest to subscribers of Genii Magazine. The prize is two decks of cards, and the joy and frivolity of searching through Genii on Ask Alexander! These decks will be shipped post paid anywhere in the world. The challenge will be to answer the contest question and whoever correctly answers first will receive the prize. Find the worth of a photograph to Dai Vernon. Use the title of the object of the photograph to find an article about a book. The psuedonym of one of the men mentioned in the article will lead you to an article where he is discussed at length. Which book was he trying to acquire as part of a trade? Thank you for trying and Good Luck! Happy Erdnaseum to everyone!